How Is Spinal Decompression Therapy Using the Dynatronics Dyna Pro Different From the Older Form of Traction? Can Spinal Decompression Therapy Using Dynatronics Dyna Pro Help My Pain? 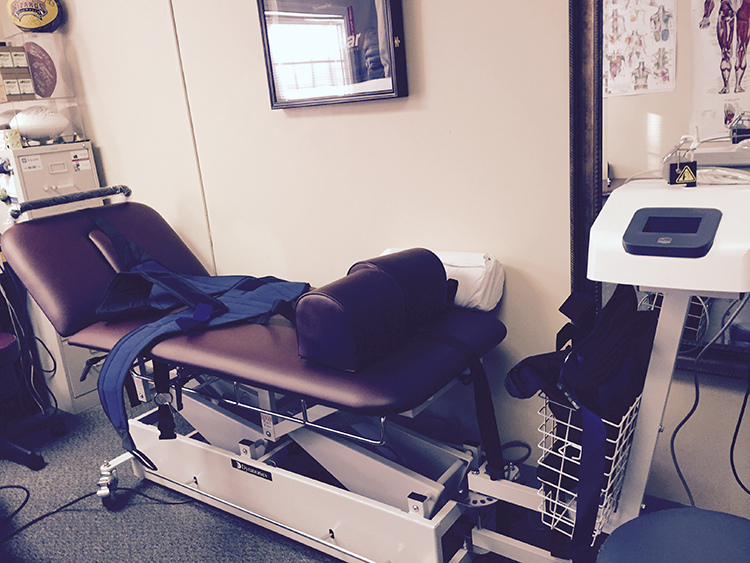 How Much Will Chiropractic and Spinal Decompression Cost? Research to develop this procedure was conducted by prominent physicians, engineers and technicians at major teaching hospitals. Our Dynatronics Dyna Pro Decompression System is FDA approved and has been clinically proven to provide pain relief and decrease symptoms associated with herniated and/or bulging discs. 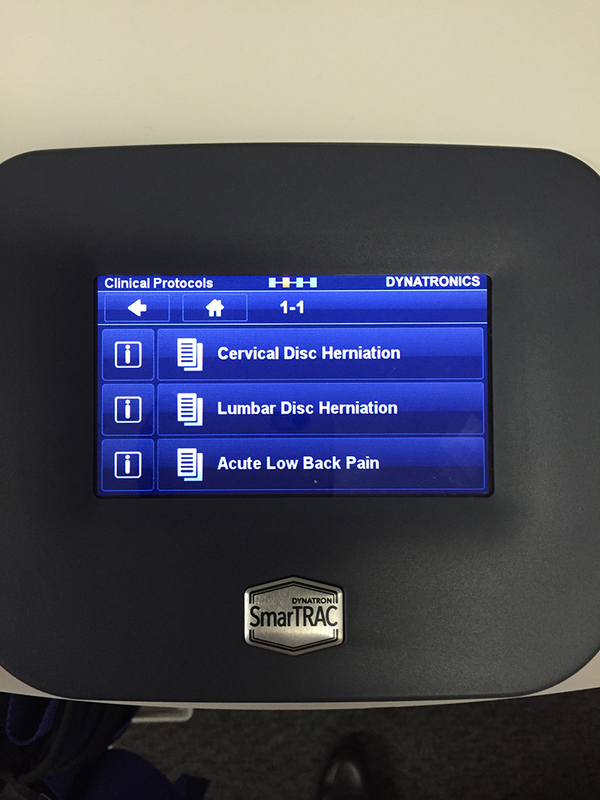 Using the Dynatronics Dyna Pro in conjunction with other chiropractic and adjuncts therapy treatments provided in our clinic can effectively relieve the pain and disability resulting from disc injury and degeneration. The treatment aids in the healing of damaged discs and reverses dystrophic changes in nerves. The Dyna Pro treats the functional and mechanical aspects of spinal disc pain through non-surgical traction (decompression) of spinal discs. Our new, computer-controlled Dyna Pro is designed to apply distraction and decompression to the patient's spine without producing reflex paravertebral muscle contractions. By significantly reducing internal disc pressure, the Dyna Pro promotes retraction of the herniation spinal disc material back to a normal physiologic position and promotes the intake of fluids, oxygen, and other substances necessary for healing the spinal disc and surrounding tissues. This decompression stimulates the repair of tissues and inhibits leakage of the internal material of the spinal disc (also known as the nucleus pulposus). How Is Spinal Decompression Therapy Using the Dynatronics (Dyna Pro) Spinal Health Decompression System Different From the Older Form of Traction? Spinal decompression therapy using the Dynatronics Dyna Pro is a modern, computerized, updated form of traction. The Dyna Pro Decompression Traction System uses computer technology to control variations in the unloading (traction pull) of the spine, effectively avoiding the body's muscle contraction response. Your chiropractor can control how many progressive tension steps you experience before reaching the maximum tension. Also, the chiropractor has complete control over how long the tensions are held steady and how often they are repeated through the computerized system. After lying on the comfortable Dynatronics Decompression Traction System table, you will be fitted in a support system. The support system helps to stabilize your body. The advanced computer-controlled system automatically adjusts to the proper angle of pull (distraction), allowing us to target the specific spinal discs that are causing your pain and symptoms. The distractive forces utilize a computer controlled logarithmic curve to avoid reflex responses which would create muscle spasm. The split table design decreases friction and allows decompression of the spinal disc. While lying down on the table, the Dynatronics Dyna Pro computer simulates an anti-gravity effect on your spine that helps herniated spinal disc material to move toward its normal position, thus, reducing spinal disc pressure and pain. Patients typically describe the treatment as a gentle, painless, intermittent pulling sensation. Patients typically undergo 15 to 20 decompression treatment sessions and the treatment session will include additional adjunct rehab therapy. A complete chiropractic & decompression session can last between 30 and 45 minutes. However, treatment time will vary upon a patient's condition and is determined by a thorough pre-treatment chiropractic evaluation. It is important to note that many patients get substantial, immediate relief after just a few to several treatments. Though each patient is different and no chiropractor can guarantee success, the clinical results of this type of therapy have been shown to be effective in 86% of patients treated. The common problems of many back conditions are damaged spinal discs and poor spinal muscle control. Our treatment program addresses both of these core problems. The specially-designed Dynatronics Dyna Pro Decompression Traction System creates a controlled unloading of the spine which appears to decrease spinal disc pressure while increasing blood and nutrient exchange. This blood and nutrient exchange is critical to aid in the spinal disc healing process. Muscle strength, control, and endurance can all be improved with our spinal chiropractic program which will includes specific controlled spinal exercises. Treatments using the Dynatronics Dyna Pro are one of the most gentle and comfortable therapies available. The treatments utilize FDA-cleared equipment with proven safety and efficacy. Most patients report a mild sense of stretching on their back or hips, and often fall asleep during treatment sessions. The Dynatronics Dyna Pro Decompression Traction System is produced by one of the world's largest manufacturers of hospital-based therapy and rehabilitation equipment, Dynatronics based in the USA. Although traction therapy has been around for thousands of years, spinal decompression therapy using the Dynatronics Dyna Pro is new. Advances in equipment and procedures have dramatically improved effectiveness of the treatment. Continual improvements in the traction / decompression system and regular updates in protocol keep this system in the forefront of non-invasive disc therapy. Each year over 50,000 patients are treated with this type of therapy and that number is growing. This depends on the complexity and extent of treatment needed, however, we typically treat patients 3 times a week for approximately 1 to 2 month, and then the patient is transitioned from passive to active treatments. The treatment is administered over a reasonable time frame and the patient's response to treatment is continually evaluated. Chiropractic treatment may be increased or reduced in frequency depending on the response to treatment. The Chiropractic therapy phase may include additional spinal decompression treatments using the Dyna Pro coupled with therapeutic exercise, stretching, and spinal adjustment / manipulation to enhance the response to treatment. 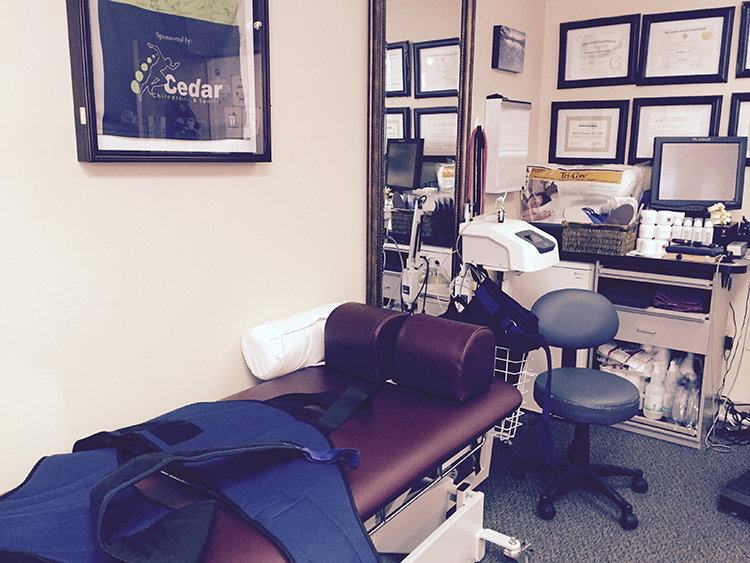 Most patients discontinue spinal decompression / traction treatments after 4 to 6 weeks. 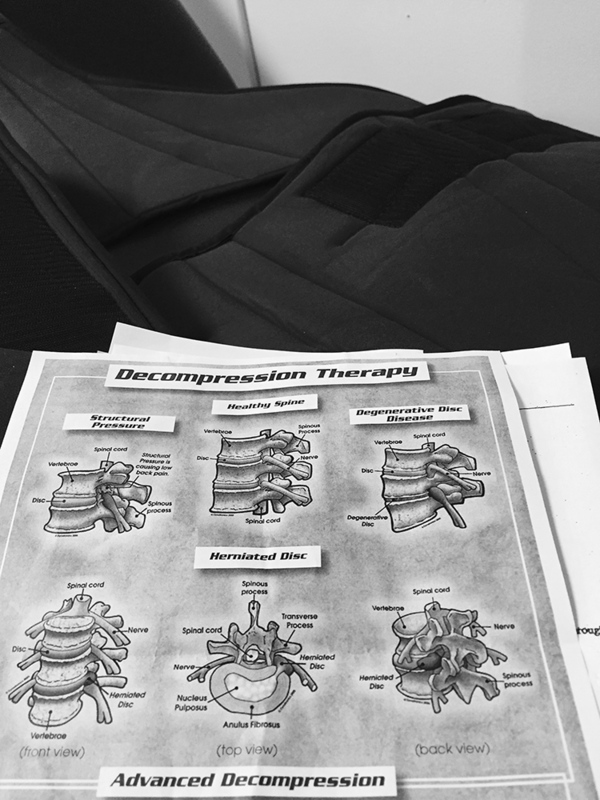 Spinal decompression therapy using the Dyna Pro, as practiced in our clinic, is a comprehensive program of the newest decompression traction techniques. This therapy can integrate other therapies which may include: targeted spinal muscle stabilization exercises, spinal and soft tissue manipulation. Our approach to treating spinal disc injury with a combination of treatments is what sets our clinic apart. Our clinic may also couple various other form of treatments such as Graston Technique, Myofascial Release, Cold Laser and Shockwave. Additionally, spinal discs have been shown to be a predominant site of pain, so directing treatment the spinal disc can be an effective treatment approach. The blending of focused decompression traction at the injury site, rehabilitation to the supporting structures, and overall strengthening / conditioning of musculature makes the treatment unique. In addition to the injury to the spinal disc, it is important to condition the supporting spinal muscles. A complete physical therapy program targeting the function of the spinal stabilization muscles is vital. Moist heat, electric stimulation, cold laser, shockwave therapy, ultrasound therapy, soft tissue and joint mobilization can offer additional benefits for reduction of inflammation and muscle spasm. Most basic Chiropractic services are covered and only some insurance cover Spinal Decompression by your health insurance and patients are typically responsible for co-payment, co-insurance, and / or insurance deductibles as well as any balances. Since insurance coverage varies between insurance plans, our billing staff will review all costs, payment options, and insurance coverage before treatment begins.